Georgetown has hired former star player Patrick Ewing to be the school's new head coach, the team announced. He replaces John Thompson III, the son of Ewing's former coach with the Hoyas, John Thompson Jr.
Ewing, 54, joins Chris Mullin of St. John's as the only Division I head coaches who were Hall of Famers as players. Both schools are in the Big East Conference. "My four years at Georgetown were the best of my life," Ewing said in a statement released by the school. "Georgetown is my home and it is a great honor for me to return to my alma mater and serve as the next head coach. I have been preparing to be a head coach for many years and can't wait to return to the Hilltop." Ewing, who has been the associate head coach of the NBA's Charlotte Hornets, met Monday with Georgetown officials. The Hornets play Tuesday night in Washington against the Wizards, affording Ewing the chance to meet directly with Georgetown. "This is a big loss for the Charlotte Hornets, but we are all excited for Patrick to have the opportunity to go back to Georgetown. Everyone knows how much his alma mater means to him," Hornets coach Steve Clifford said in a statement. "I've had the privilege of working with him for 12 years with three organizations and I know the effort he has put into coaching. He has attacked this profession with the same mentality he had as a player, with hard work, dedication and a passion for the game of basketball. "I'm thrilled that all of Patrick's hard work has paid off and he has earned the opportunity to be Georgetown's head coach. We wish him the best of luck in the next chapter of his coaching career." Ewing was the preferred choice of Thompson Jr.
Ewing is a Georgetown legend who played for the elder Thompson from 1982 to '85, guiding the program to three national championship game appearances and one title. He went on to have a Hall of Fame career in the NBA, playing 15 of his 17 years in the pros with the New York Knicks. Ewing is also a two-time Olympic gold medalist. Georgetown fired Thompson III on March 23. He spent the past 13 seasons as the Hoyas' coach, going 278-151 with eight NCAA tournament appearances. Georgetown finished 14-18 this season, including a 5-13 mark in Big East play. 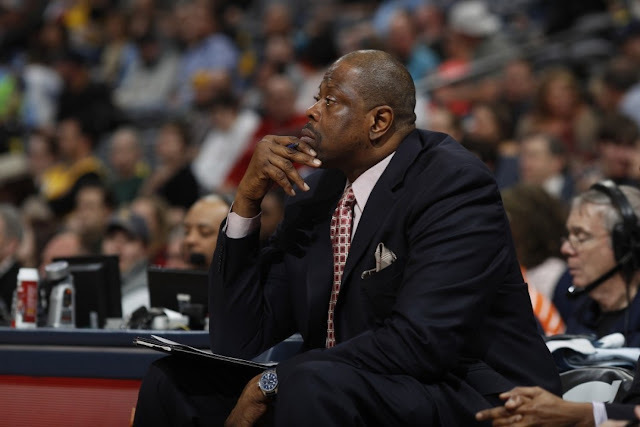 Georgetown named Patrick Ewing its next men’s basketball coach Monday, placing the program in the hands of its most decorated player and extending the legacy of former coach John Thompson Jr., who transformed the Hoyas into a national power starting in the 1980s. University President John J. DeGioia and Athletic Director Lee Reed announced the hire after meeting with Ewing, who had been an NBA assistant for the past 15 years, most recently with the Charlotte Hornets. Ewing emerged as the top choice for the position, according to people familiar with the search process, soon after Georgetown parted ways with John Thompson III. The eldest son of Thompson Jr. was dismissed less than two weeks ago in an uncomfortable separation from a family that has become synonymous with the school’s athletics program. Since Thompson Jr. took over the basketball program in the 1972-73 season, the school’s only coach other than a Thompson had been Craig Esherick, a former assistant under Thompson Jr. whom Thompson III replaced in 2004. Terms of Ewing’s deal were not disclosed. Thompson III was paid more than $3.6 million by the university in 2014, according to tax documents. Ewing’s hire underscores Georgetown’s relationship with the Thompson family and in particular Thompson Jr., who has a longstanding friendship with DeGioia. Ewing was Thompson Jr.’s first major recruit, and they won the 1984 national championship and made three Final Four appearances in four seasons. The move also is emblematic of the sway Thompson Jr. continues to hold at the university, which last year opened the 144,000-square-foot John Thompson Jr. Intercollegiate Athletic Center at a cost of roughly $62 million. Substantial donations from former players, including $1 million from Ewing, helped fund the building where Thompson Jr., 75, still has an office. Ewing graduated from Georgetown in 1985 after being named consensus first-team all-American for three straight years, beginning when he was a sophomore. He is second at Georgetown in career points and first in career rebounds, blocks and games played. Ewing is one of four players in school history with 2,000 career points. The New York Knicks selected Ewing with the No. 1 overall pick in the 1985 NBA draft. He went on to win NBA rookie of the year and was an 11-time All-Star during a career spanning 17 seasons. He was inducted into the Naismith Basketball Hall of Fame in 2008. Ewing has no previous head coaching experience but did serve lengthy stints as an assistant with the Houston Rockets under former coach Jeff Van Gundy and the Orlando Magic under coach Stan Van Gundy. Ewing joined Hornets Coach Steve Clifford’s staff in 2013. The Ewing connection to Georgetown also includes his son, Patrick Ewing Jr., who played for Thompson III and served as the Hoyas’ director of basketball operations for the past two seasons. At the Final Four in Glendale, Ariz., college basketball insiders lauded Ewing’s basketball acumen and strong ties to Georgetown. They also, however, stressed his success would hinge on making adjustments to off-court demands of the college game as well as hiring an experienced staff to help navigate unfamiliar territory, such as recruiting and NCAA compliance. It’s unclear what system Ewing plans to install at Georgetown, but his NBA background suggests perhaps a style vastly different than that of his predecessor, who ran a motion-based offense with principles from his previous head coaching stop at Princeton. That offense stagnated in recent iterations, in part contributing to the Hoyas finishing with a losing record for a second straight season and missing the NCAA tournament for a third time in four years. The downturn led to calls from students, alumni and others within the fan base for Thompson III’s removal. Ewing becomes the second former Big East player of the year to coach at his alma mater. In 2015, St. John’s hired Chris Mullin as its coach to rebuild a program that once competed regularly with Georgetown for supremacy in the Big East during the conference’s formative years. Ewing was in the District on Monday initially with the Hornets, who are scheduled to play the Washington Wizards on Tuesday night at Verizon Center. It’s unclear if Ewing will be on the bench for that game or begin his new duties immediately with the college recruiting process set to open Thursday. 0 Response to "Georgetown hires former star player Patrick Ewing as coach"